TORONTO, June 6—She’s got more of them than any other active Kingston-area athlete, but Shirley Hughes-Ryan will tell you it’s not about the medals. “It’s not a thing where I’m racing and trying to be first every time,” Hughes-Ryan said after she captured the silver medal in the 800 metres for ambulatory girls at the Ontario Federation of School Athletic Associations track and field championships. “It’s about running and doing what I’m supposed to do, which is compete and have a fun day." For the young Sydenham High School athlete, it was the second medal of the meet, won in addition to the silver from the 100 metres Friday. That’s four medals in three years for Hughes-Ryan, more than anyone else currently competing for a KASSAA school, and more in the disabled events than anyone from the county has ever won. Hughes-Ryan’s medal was one of two won by Kingston Area athletes on the final day of the three-day meet, giving the 71-member local contingent seven medals altogether, five silver and three bronze. Alas, none of them was gold, however, and that hasn’t happened since 2010 in London, when, for the second year in a row, local competitors failed to win an event. In addition to Hughes-Ryan, Cole Horsman also won his second medal of the meet, bronze in midget boys 200 metres. Hughes-Ryan said her formula for success is simple: “What I think about is just running as fast as I can,” she said. That’s not to say, however, that the medals aren’t a source of pride. She certainly wasn’t about to take today’s off before she left the stadium. Though there were some other perfectly fine performances Saturday, not everybody was happy about them. Ben Cross, for one, was deeply disappointed in his fourth-place finish in senior boys javelin. Long before Lee Kucera of Chatham-Kent unleashed his winning throw of 57.32 metres—and two other competitors, with their fifth and sixth attempts, pushed Cross, who’d been second since the third round, off the podium—it was clear from the body language that the Frontenac senior was not pleased with himself. As the disappointment grew, Cross found himself fiddling with his technique. “It was a little bit off,” he said. He tried to generate more speed, and he tried to find his “point,” the spot where the javelin is in just the right place that, out of the corner of his eye, a thrower can tell it’s going to have the correct trajectory. He never found it and, as a result, Cross ended with a best throw of 52.83 metres, a hair below his season best and almost three metres off his lifetime best. “When I was practising on Tuesday I was in the sixties multiple times,” he lamented. “I had it on the right angle, right where I wanted it to be when I was releasing, and I was able to hit the big numbers, but today I wasn’t able to do that. For Cross, a silver medalist in 2012, that it was his fourth top-five performance in four years was of little comfort. It was also the second time in three years he was in a medal position and watched as first one opponent, then another, ultimately shuffled him off the podium. Cross, throwing second last, had the hammer on two of them today, but he managed to throw just 50.23 metres on his final attempt. Kingston Collegiate junior Jackie Quesnel, though she was also the first one off the podium in her event, the 800 metres, felt a little better about herself. Quesnel said she suspected the field would be tightly bunched because the heat and seed times were quite similar. “I knew there was going to be a pack of us and that’s what happened,” she said. Near the back of that pack for the first lap, with about 300 metres to go Quesnel moved up to take over third place and challenge for second. Just as she took second place with about 200 metres to go, the runners both in front of her and behind her also picked up their pace. A battle ensued for 100 metres, at which point the other two started to pull away. “I know I have some speed so I like to kick at the end,” Quesnel said. “With about 200 metres left to go I was giving it my all but then, with about 25 metres left, there were three girls ahead of me who pulled ahead. Quesnel, who won the bronze medal at OFSAA as a midget a year ago, finished with a time of 2 minutes 17.65 seconds, a personal best by 48 one-hundredths of a second and a time that represented an improvement of seven and a half seconds over the season. 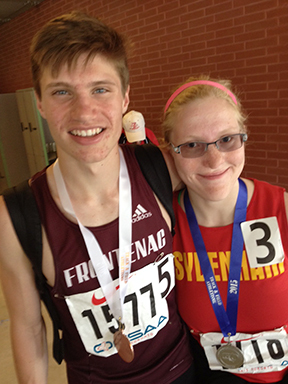 Among the five other Kingston-area athletes who finished in the top eight of their respective events today, two others also attained personal bests, Ben Workman of KC in senior boys 3,000 metres and Chelsea Hiemstra of La Salle in midget girls shot put. Workman, bronze medalist as a junior in 2013, led for most of the race and twice successfully answered challenges from second- and third-place runners in the middle laps. With about 500 metres to go, however, Workman was passed by three opponents. Gamely, he stayed with the front-running back and with 300 laps to go, made a move and regained the lead. Over the back straightaway, however, the lead changed hands three times and Workman had nothing left. He finished fifth, but with a time, 8 minutes 32.46 seconds, that was an eight-second personal best. Though she had a four-meet winning streak come to an end, Hiemstra extended her personal best for the fourth straight week, this time leaving it at 10.99 metres. In a remarkably consistent day, her six puts were all within 62 centimetres of each other. Hiemstra had the dubious fortune of being in the field the day Trinity Tutti of Welland Eastdale decided to rewrite the record book not once, but five times. The old record, 12.10 metres, set last year by Grace Tennant of South Lincoln, fell when Tutti threw 14.28 metres with her first attempt. Tutti broke that record four times with successive puts, leaving it at 15.92 metres. Also posting top-eight finishes Saturday were Brogan MacDougall of Regiopolis Notre Dame (fourth, midget girls 800 metres), and KC’s Marissa Battle (fifth, junior girls 200 metres) and Amanda Black (junior girls high jump). The final tally for Kingston-area athletes was seven medals, among 28 top-eight performances, with 18 personal bests in the 53 individual events in which they competed. Next year’s meet will be held in Windsor.